Waymo, the self-driving car company run by Google's parent Alphabet, is adding a new vehicle to its fleet in the form of the sleek, all-electric Jaguar I-Pace. In fact, it's adding 20,000 of the Jaguar creations to its self-driving fleet over the next few years. This week, we saw one of these specially outfitted Jaguars parked inside the Shoreline Amphitheatre concert venue during the Google IO 2018 conference. The $69,500 / £63,495 luxury car wasn't running, or even opening its doors to passengers for a peek inside as it was cordoned off beyond nylon barriers, but despite this, the compact SUV left a striking impression. The Jaguar I-Pace is rigged for self-driving, decked out in the Waymo sensors, cameras and lidar it'll need to scan the world around it to detect objects in the road and read street signs. Yet it maintains a distinct sense of style; you almost don't even notice the giant black orb on its roof or white boxes protruding from its sides. It's a car you'd like to take for a test drive regardless if it was a self-driving vehicle or not, that's for sure. As with Waymo's Chrysler Pacifica Hybrid minivans, one of which was also on display at IO, the I-Pace will use machine learning to navigate tricking driving conditions, such as driving in the snow. To date, Waymo has driven 6 million miles on public roads in addition to hundreds of millions of virtual miles, experience and technology that the company says help to make its vehicles the most reliable self-driving cars on the road. 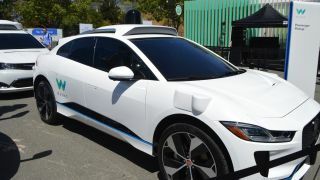 Waymo has the ambitious plan of setting the Jaguar I-Pace free to pick up passengers in Phoenix, Arizona as part of self-driving transportation service this year.